Robbie Williams, Taylor Swift, Will.i.am, Jessie J, PSY, Union J, Olly Murs, The Wanted, Lawson and more! See the amazing high definition pictures of the Summertime Ball 2013's line-up. 1. Robbie Williams closes Capital's Summertime Ball 2013 with an old favourite, 'Angels'. 2. Robbie Williams performs 'Candy' in a bright red blazer as the final act at Wembley Stadium. 3. The stage is set ablaze for Robbie Williams's performance of 'Angels'. 4. Robbie Williams is illuminated on stage as the sun goes down over the Summertime Ball 2013. 5. The 'Feel' singer glows in front of a bright green backdrop on stage at Wembley. 6. Wembley Stadium is ablaze with fireworks as Capital's Summertime Ball closes. 7. Robbie Williams closes the Summertime Ball 2013 with 'Angels'. 8. Robbie Williams performing 'Let Me Entertain You' at The Summertime Ball 2013. 9. The Take That singer performs 'Rock DJ' at Capital's Summertime Ball 2013. 11. Will.i.am is joined onstage by a robot to perform former number one 'Scream and Shout' at Wembley. 12. 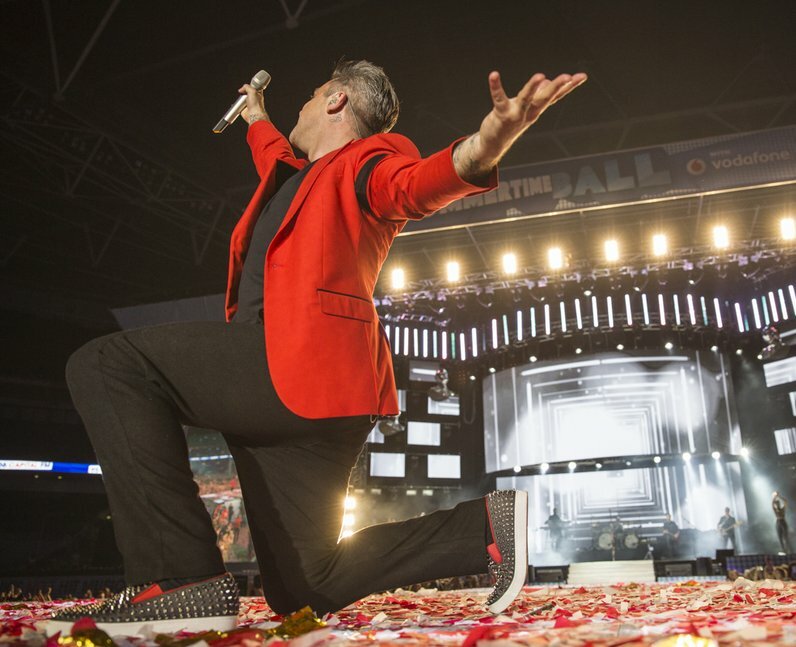 Robbie Williams fills Wembley Stadium performing 'Candy' The Summertime Ball 2013. 13. The crowd enjoys Will.i.am performing at the Summertime Ball 2013. 14. Will.i.am wows the crowd with '#thatpower' at Capital's Summertime Ball 2013. 15. Will.i.am flaunts white sunglasses and a black hat during his performance at the Summertime Ball. 16. Will.i.am is joined by dancers in similar outfits to hisd own at the Summertime Ball 2013. 17. Will.i.am performing a dance routine to '#thatpower' at the Summertime Ball 2013. 19. Taylor Swift wears black leather shorts and a white shirt at The Summertime Ball 2013. 20. Taylor Swift opens with her current hit single '22' at The Summertime Ball 2013. 21. Taylor Swift wears black hot pants and red lipstick to perform at Wembley Arena. 22. Crowds enjoy Taylor Swift's performance at the Summertime Ball 2013. 24. Taylor Swift performs a dance routine at Wembley Stadium for the crowd - full of Swfities. 25. Surprise! Taylor Swift hugs singer Ed Sheeran before the pair perform a duet for the crowd. 26. Taylor Swift's microphone matches her lipstick at the Summertime Ball 2013. 27. Justin Timberlake wows the crowd performing an acoustic version of 'Cry Me A River'. 28. Justin Timberlake sings old favourite 'Cry Me A River' on stage at the Summertime Ball 2013. 29. Justin Timberlake smiles at Wembley Stadium performing a surprise acoustic set. 30. Union J make an entrance at Capital's Summertime Ball 2013. 31. Union J -JJ , Jaymi , Josh and George, cover Carly Rae Jepson's huge hit 'Call Me Maybe' on stage. 32. Duke Dumont performs 'Need U' featuring A*M*E at the Summertime Ball 2013. 33. Duke Dumont performs at the Summertime Ball 2013. 34. Justin Timberlake, Lisa Snowdon and Dave Berry perform hosting duties at the Summertime Ball 2013. 35. Jessie J is joined by surprise performer B.O.B for their hit single, 'Price Tag'. 36. Jessie J wows 80,000 audience members at Capital's Summertime Ball 2013. 37. Jessie J shows off some raunchy dance moves at the Summertime Ball 2013. 38. Jessie J performs hit single 'Laserlight' at the Summertime Ball 2013. 39. Jessie J performs for the crowd at Wembley Stadium. 40. Jessie J wears a black dress to perform 'Who You Are' at the Summertime Ball 2013. 41. The Saturdays take to the stage for Capital's Summertime Ball 2013. 42. Frankie, Mollie, Una and Vanessa perform hit single 'All Fired Up' at Wembley Stadium. 43. The Saturdays's Mollie gets close with a backing dancer at the Summertime Ball 2013. 44. Vanessa White from The Saturdays flaunts dark trousers and a corset style top. 45. Una Healy wears bright pink shorts to perform at the Summertime Ball 2013. 46. Mollie King shows off some dance moves in a purple and white outfit at the Summertime Ball. 47. Olly Murs arrives on stage in a smart white jacket at the Summertime Ball 2013. 48. Olly Murs wows Wembley Stadium performing hit single 'Army of Two'. 49. Olly Murs jumps in the air during his performance of 'Army of Two'. 50. Olly Murs greets fans filling the stadium for Capital's Summertime Ball 2013. 51. Olly Murs and Rizzle Kicks duet at the Summertime Ball 2013. 52. Olly Murs and Rizzle Kicks duet on 'Heart Skips A Beat' at The Summertime Ball 2013. 53. The 'Troublemaker' himself performs at the Summertime Ball. 54. The Loveable Rogues domiante the stage at Wembley Stadium. 55. Naughty Boy performs his massive summer hit 'La la la' at the Summertime Ball 2013. 56. Child dancers dressed in school uniform join Naughty Boy to perform. 57. Naughty Boy and Sam Smith takew to the stage at Wembley Stadium. 58. Sam Smith wows the 80,000 strong crowd at Wembley. 59. Lawson's drummer Adam Pitts performing at the Summertime Ball 2013. 60. Charlie Brown performs hit single 'On My Way' in a bright blue jakcet at the Summertime Ball 2013. 61. Artist Charlie Brown performs below the famous Wembley Stadium arch. 63. James Arthur sings his number one single 'Impossible' at the Summertime Ball 2013. 64. Lawson perform 'Standing in the Dark' at the Summertime Ball 2013. 65. Lawson's Andy Brown performing the band's track 'Taking Over Me' at the Summertime Ball 2013. 71. PSY shows off his famous 'Gangnam Style' horse dance on Wembley Stadium's middle stage. 72. Ellie Goulding performs hit single 'Anything Could Happen' at the Summertime Ball 2013. 74. Rizzle Kicks perform 'Mama Do The Hump' at the Summertime Ball 2013. 75. Jordan 'Rizzle' Stephens greet the crowd at the Summertime Ball 2013. 78. Rizzle Kicks flaunt their bodies for the 80,000 people filling Wembley Stadium. 82. Lawson and B.o.B duet on 'Brokenhearted' at the Summertime Ball 2013. 84. PSY chose a smart red waistcoat to perform for 80,000 people at the Summertime Ball 2013. 85. PSY dominates the stage at Wembley Stadium. 86. PSY takes centre stage at the Summertime Ball 2013 performing new single 'Gentleman'. 91. AlunaGeorge and Disclosure perform hit single 'White Noise' on stage at the Summertime Ball 2013. 92. Disclosure -aka brothers Howard and Guy Lawrence - perform their Summertime Ball debut. 93. Sam Smith joined Disclosure on stage at Wembley Stadium to perform hit single 'Latch'. 94. Labrinth wore a smart blue suit and glasses to perform his hits at Capital's Summertime Ball 2013. 95. Labrinth opens his set at Wembley Stadium with 'Express Yourself'. 97. Ellie Goulding entertains the crowd on stage at Capital's Summertime Ball 2013. 98. Ellie Goulding performed 'Anything Could Happen' for 80,000 fans. 99. The crowds at Wembley Arena are loving the atmosphere at Capital's Summertime Ball! 100. Ellie Goulding shines in an all-white outfit during her Summertime Ball set. 101. Ellie Goulding performs 'Anything Could Happen' at the Summertime Ball 2013. 102. 'Starry Eyed' singer Ellie Goulding wows the crowd at the Summertime Ball 2013. 103. Ellie Goulding performs to a packed Wembley Stadium at Capital's Summertime Ball 2013. 104. The Wanted's Nathan Sykes surprises fans live onstage at the Summertime Ball 2013. 105. The Wanted open The Summertime Ball 2013 with a stunning performance of 'All Time Low'. 113. The Wanted's Nathan puts in a surprise appearance at the Summertime Ball following throat surgery. 114. Nathan Sykes views the 80,000 strong crows during The Wanted's opening performance. 115. Crowds get excited for the performances at Wembley Arena. 116. The Wanted perform at Capital's Summertime Ball 2013. 117. The Wanted's SIva listens to the screaming crowd at Wembley Arena. 118. Crowds fill Wembley Arena at the Summertime Ball 2013. 119. Capital presenters Marvin and Max greet the 80,000 Summertime Ball fans. 120. The Wanted's performance featured amazing pyrotechnics at The Summertime Ball 2013. 122. Marvin treats fans to a DJ mix set to kick off Capital's Summertime Ball 2013.